I first attended Disc Jam in 2013. I remember driving to Brimfield, Massachusetts from New York with two friends, excited to see what the small festival had to offer. It was pretty new and the lineup was filled with mid-level bands from the northeast. The overall vibe was intimate and the concept was original. Upon arrival, it was apparent that it was cultivated by a group of people that loved live music. It was the definition of grassroots and the farthest thing from a corporate event. I later found out that the founder was a guy by the name of Tony Scavone. He had spent countless years following Phish and the Disco Biscuits, building relationships with musicians and fans alike. So, when he had the idea to create his own festival, the process was relatively natural. But he needed to find the right venue and put together a team that he could rely on. In its early stages, Disc Jam helped push up and coming bands like Twiddle, Turkuaz, and Dopapod to new heights. It gave them a decently sized stage to experiment and test the waters of performing at festivals. Artists were able to build relationships with their peers as well as gain new fans in a way that was organic and real. I remember thinking that Disc Jam could really progress if they worked out the kinks and executed their vision professionally. After that year, Scavone and his team found a different venue for Disc Jam. Still in Massachusetts, they moved to Camp Coldbrook, which was thirty minutes away from the prior location. It went well, but it didn’t feel like home. Disc Jam needed to find a permanent venue or the festival would’ve went by the wayside like we’ve seen so many times before. The location in Stephentown, NY breathed new life into Disc Jam. It presented a legitimate opportunity for freedom and growth. Tony Scavone had finally found the venue that he needed to take his festival to the next level. With Dopapod and Electron as headliners, the first year in New York went great. Disc Jam had found the venue that it needed in order to flourish. The loyalty from certain bands definitely helped build a strong foundation. Using the blueprint that Camp Bisco had created so many years before, Disc Jam curated a unique mix of live and electronic music. The production levels steadily increased as did the ticket sales. It’s been five years since I first attended that small grassroots festival in Brimfield, Massachusetts. I watched this festival grow before my eyes. And after all the ups and downs that the Disc Jam team faced, they officially sold out the festival for the first time ever. It’s a remarkable feat that is no easy task. As somebody that’s been working my way into the industry, it’s inspiring to say the least. One thing is for sure, it would’ve never happened without the network that Scavone created through his love and passion for live music. I arrived on Saturday afternoon after debating whether or not I would attend. I’m very happy that I decided to make the trek upstate. Ghost Light, Tom Hamilton’s new band, was on stage when I arrived. I saw their first New York show in April and I immediately knew that this band was something special. This is the band that is going to take Tommy Hamilton where he needs (and deserves) to go. As my friend says, “It’s his magnum opus”. I couldn’t agree more. The way that he and Holly Bowling toss melodies back and forth is magnificent. Their intent is evident to everyone in the crowd every time they perform. Their set at Disc Jam proved to me that what I had originally thought was true. With Raina Mullen on rhythm guitar and backing vocals, Tommy has more than enough room to soar. He attacks improvisation with a fearlessness that was sometimes missing in American Babies. Not to mention the rhythm section is unbelievably strong; Steve “Steaks” Lyons and Scotty Zwang mesh together as a powerful unit. As I looked around the crowd, brains were being cradled by the raw experimentation of Ghost Light. It’s as if Hamilton was able to catch the lightning of late 70’s Dead in a bottle, keeping it hidden for years, only to release it when the time was right. Well, that time is now and music fans couldn’t be happier. Beats Antique is an act that I’ve been seeing at festivals for years. To be honest, I never loved them but they’re definitely interesting. Whether you like them or dislike them, you have to admit that what they do is original. They played a pretty cool Primus remix that stuck out to me – it was a cross between sampling and live instrumentation. During their set, I walked around the main stage and caught up with friends that I hadn’t seen in a while. The sun made it’s slow yet steady descent as the festival grounds came alive. There was a sense of calm anticipation that lingered in the air. The night was about to begin. Some of my all-time favorite Lotus moments took place at Catskill Chill. There was something special about that venue that brought out the best in the band. Since The Chill entered its hiatus, there has been a void for upstate New York Lotus. After years of fans begging Disc Jam to book them as the headliner, they finally made it happen, and it paid off big time. I truly believe that the combination of Lotus and Electron is what helped push Disc Jam to the next level in terms of ticket sales. People had high expectations for Lotus and they delivered the goods. Opening with Bellwether, they let the jam take shape on its own, and everybody felt it. Guitarist Mike Rempel took the lead as they created space to find the magic. And when I thought they were going into Livingston Storm or Did Fatt, they drop-segued into Hammerstrike. It threw me off for a moment, but they executed with precision, ending with a phenomenal solo from Rempel. His phrasing was thoughtful and his tone was sharp. After two songs, I immediately knew that they came to Disc Jam prepared. “Night has fallen in the Catskills”, Luke Miller proclaimed as they tuned for their next song. Space in Between is in the same vein as Mikesnack and Sid. It’s funky without being too predictable. It showcases tasteful percussion from Chuck Miller. It’s a great song to watch Mike Greenfield do what he does best. His gracefulness and dynamics are in full effect whenever they play the song live. Bassist Jesse Miller directed the band into the jam with an absolutely filthy bassline. His style of picked bass dropkicks you directly in the chest, and I love it. Rempel sat back as Luke lead with synths, they picked up the pace and jammed into the ending of Bellwether. The crowd began to move more and more as the energy level on stage increased. Out of all the new songs that Lotus has released, Bug Love is unquestionably one of the best. It sounds and feels like Lotus. Old and new fans love it for the same reason, it’s natural. The band gives Rempel the reins and encourages him to fly, which he does ever so elegantly. The second half of the song gives fans a look into his jazz-fusion influences. It’s clear as day that he’s a disciple of Pat Metheny. I have a strong feeling that this song will be in rotation for years to come, and rightfully so. Inspector Norse is easily one of the best covers that Lotus has ever had in their catalogue. Over the years, they’ve been able to put their signature twist on it in a way that is authentic and respectable. It’s also a tremendous jam vehicle for them. Greenfield and Jesse put together an explosive section of thunderous drum and bass before dropping into four-on-the-floor. With e drums in full effect, Rempel and Luke dance around each other with risky playfulness. It gets sludgy and dark before entering a blissful horizon and breaking into the eye of the storm. The jam into Contagion was one of the obvious highlights. The song is one of my personal favorites, it touches on everything that I love about Lotus. It’s atmospheric yet punchy, bouncy and light yet steady and strong – it’s an emotionally well-rounded song. They didn’t miss a single beat in the composition which spring-boarded them into a monstrous jam. It got dark and heavy very, very fast. It was almost intimidating at one point. Jesse’s low end was shaking the stage. Luke and Rempel laid down haunting riffs while Chuck made excellent use of his woodblocks and cowbells. They captured every ounce of energy at Disc Jam and catapulted it back into the crowd with serious conviction. And as symbolic as music can be, Lotus brought the crowd out of the darkness with a slick transition into Spiritualize. The jam was snappy right off the bat. Jesse’s bassline cracks you in the jaw as Rempel’s soft delay picked you up off the ground. The jam contained my favorite Rempel riff of the night. Forget the same page, all of them were on the same sentence in the same paragraph. They weren’t getting stuck in any stale ruts, instead, they were moving from one theme to the next like stepping stones in a shallow stream. Without overthinking or being too cautious, instead just trusting their instincts and listening to each other. Inspector Norse > Contagion > Spiritualize is undoubtedly one of the best segments of the year. Pachyderm is a tricky little song that gives each member the spotlight throughout. Rempel went off with his best impression of a Hendrix styled solo. It was short and to the point, but incredibly tight. Livingston Storm came next, I had been waiting for it since the beginning of the set. It was placed in the right spot, giving Disc Jam a dose of sonic relaxation. They stripped all expectations from their minds and let their souls shine. Greenfield was astonishing with impeccable swing and feel, he was putting everything he had into every single beat with such finesse. Next came Eats the Light, a song off of their new album. They closed with an emotional version of Sunrain that featured delicate chords from Luke as Rempel sprinkled linear melodies on top. It was a real treat to witness Lotus play up to their potential at a festival. The band is capable of amazing things when they don’t overthink improvisation. Mike Greenfield was the MVP as he immediately made his way to the tent for Electron when Lotus ended. He played four hours straight and he showed no signs of letting up. He joined his close friends Marc Brownstein, Aron Magner, and Tom Hamilton for a killer set of jamtronica. Lotus passed the baton to Electron and they picked it up without a hitch. 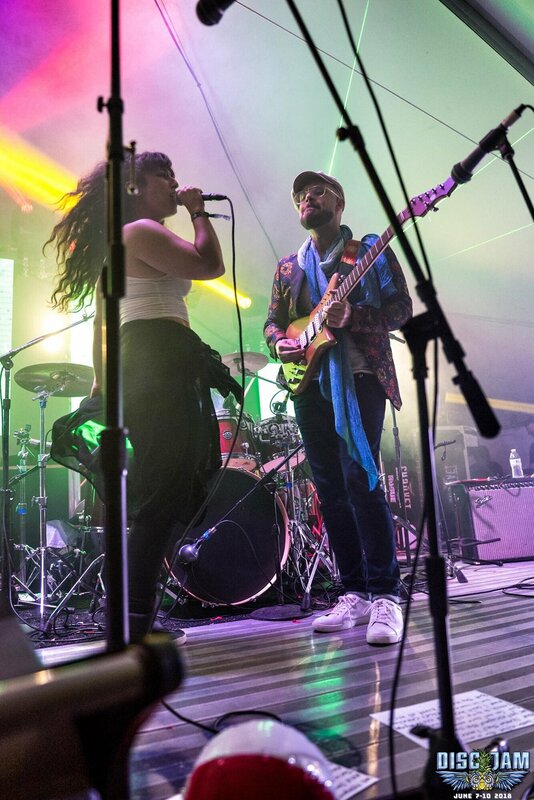 Ever since Electron played their first festival set at Catskill Chill in 2015, they’ve been a fan favorite. Individuals that follow the Disco Biscuits and Lotus, as well as fans that miss the days of Brothers Past, are almost guaranteed to love Electron. Their festival sets are known to bring out the best in them. Plan B is without a doubt one of the best openers that Electron has in their catalogue. It’s one of my personal favorites from Marc Brownstein’s rock opera ‘Chemical Warfare Brigade’. The band wasted no time and started jamming immediately. By the time they dropped into the first verse, all four of them were warmed up. Well, Greenfield was already warmed up after a more than solid set with Lotus. The man had back to back sets and played drums for four hours, and he didn’t miss a beat. The fact that Electron hasn’t played a single show besides Disc Jam makes this set that much more special. Tommy pushed the band to get extremely experimental. Listening back, you can definitely hear the stylistic inspiration from playing with Joe Russo’s Almost Dead and Ghost Light. Brownstein has said that Plan B is Tommy’s favorite Electron song to play, so I can see why he let him steer the ship during it. Little Lai came next and it started with loose improvisation that reminded me of Shakedown Street. Once the jam kicked off, it transformed to that spacey funk that made Phish famous in the early 90’s. Tommy took a page out of Tom Morello’s book and made his guitar sound identical to vinyl being scratched on turn tables. I’ve said it before and I’ll say it again, 42 is not my favorite Brownstein song. Well, it was an obvious highlight in this set. This is the moment where the band locked into the same wavelength. The syncopated grooves from Greenfield sat behind the melodic exchange of Tommy and Magner perfectly. It took them three songs to turn on the trance-fusion, but when they did, the tent erupted. Tantalize is one of Brownstein’s newest songs, they’ve played it a few times, and it never caught on as one would hope. Bringing out Shira from Turkuaz to sing it was a great decision on his part. It was the highlight of the set. Her voice changed my entire view of the song and made me realize how catchy it actually is. Her sit-in added a spark to the stage, Brownie was hopping around like a rabbit on speed. It was hilariously awesome. The jam into inverted Humu was patient and blissful. As always, the peak was explosive. They dug deep and brought out the aquatic vibe big time. Magner and Tommy have crazy chemistry and it shows every time they touch the stage together. Brownie gave a birthday shout to, “The guy that turned 42”, and they ended the segment by finishing 42. Confrontation always produces stellar improvisation. This version had the tent rocking, the upstate New York festival momentarily turned into a Brooklyn rave. It wasn’t surprising, but I was amazed at how sharp Greenfield was at the of the set. It was beyond impressive. All four of them were throwing down without a single care in the world. The Confrontation jam was pure heat-seeking trance-fusion. Disregarding Tony Scavone’s request of no covers, they closed their set with Will It Go Round In Circles and Hey Jude – a subtle jab that gave everyone a laugh. Octave Cat closed Saturday night with their smooth yet funky sound of modernized 70’s fusion. The trio is made up of bassist Jesse Miller, keys player Eli Winderman, and drummer Charlie Patierno. They were joined by guitarist Rob Compa which was especially cool. Octave Cat is a project that has serious potential to go the distance. In the climate of one generic jam band after another, they bring something to the table that is authentic and tasteful. Their album, Live from the Simulation, that they just dropped is wonderful. For a lot of music lovers, it was their first time experiencing Octave Cat. As I looked around the tent, I saw a lot of people totally focused on the stage. It was a good decision on Disc Jam’s part to book them and I hope to see them back next year. I hope to see them at a lot of festivals next year. Whenever a festival expands, there are growing pains. Was this the biggest and best Disc Jam yet? Yes. Was everything perfect? No. A lot of people feel that there are some kinks that the festival still needs to work out, and there definitely were. But I have no doubt in my mind that Scavone and his team will make next year one of the best northeast festivals to date. As the lineup gets stronger and ticket sales increase, it’s up to Disc Jam to step up to the plate and knock it out of the park. 2019 will be their biggest test yet and I’m looking forward to seeing them pull it off.